This Post has already been read 1723 times. As followed by other telecom operators Mobilink has doubled the Location based Charging Packages to Rs. 14.99 + tax per day. Previously charges were Rs. 7.99 + tax per day for LBC packages. Mobilink is offering free calls from within it network from 11 PM to 6 PM next day with dauly charges of Rs. 14.99 + tax. This offer is for some selected cities whose list can be seen on here. The call charges other then the given hours will be Rs. 0.90 + tax /30 sec for on net and on the same call rate for off-net round the clock. SMS charges for on-net is Re 1 + tax and for off-net Rs. 1.5 + tax. Offer can be obtained by dialing *108# after selecting Jazz Easy Package. 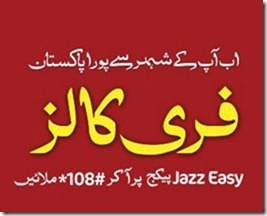 Jazz Easy Package can be subscribed by dialing 123. Validity of this offer is only for 1 day. This offer can be subscribed only on Jazz Easy package.